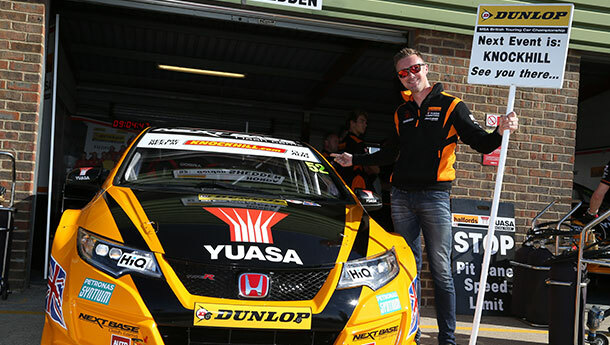 Halfords Yuasa Racing duo Matt Neal and Gordon Shedden have success in their sights as the Dunlop MSA British Touring Car Championship (BTCC) heads north of the border next weekend (13/14 August) to the Scot's home circuit of Knockhill. The BTCC returned to action following its mid-summer break at Snetterton last weekend, and behind the wheel of the potent Honda Civic Type R, Shedden and Neal immediately signalled their intent - the former battling to his second victory of 2016 and the latter strengthening his own title bid with a sixth podium finish of the year. The pair sit respectively third (Neal) and fourth (Shedden) in the Drivers' standings, with Halfords Yuasa Racing gaining ground in second spot in the Teams' classification and Honda doing likewise in the Manufacturers' chase. Both men triumphed at Knockhill 12 months ago - and the Civic has won at least one race there for each of the past three campaigns - so hopes are high as the BTCC speeds towards a thrilling end-of-season showdown. "I'm looking forward to Knockhill. It's obviously Flash's backyard, so I'll be taking a sneaky peek at his lines to see if I can get a cheeky headstart! Seriously, though, I always enjoy going there. There's a fantastic atmosphere with thousands of enthusiastic Scottish fans, who are so close to the action you can feel the vibes inside the car! The circuit itself is tremendous fun to drive and like a mini rollercoaster ride - constantly twisting and turning, meaning you never get a moment to breathe. It will play to the strengths of the rear wheel-drive machinery, but with its first-class chassis, the Civic Type R should help us to take the fight to them and rack up some solid points. We're moving into the business end of the season now, so hold on tight - sparks will fly!" "While the points are clearly worth the same at Knockhill as anywhere else, I only get to race in Scotland once a year so it does mean a lot to me - the support I receive is amazing and really gives me an extra spring in my step. Having anticipated a difficult weekend, our results at Snetterton definitely exceeded our expectations, enabling us to move up the championship standings and cut our deficit to the top of the table - so much so that I'm actually closer to the lead points-wise than I was at this stage last year! We're right back in the fight and the gloves are off. We've obviously got a bit more ballast on-board again now, but we're up for the challenge and if we can repeat our performance from Snetterton, that would be phenomenal."